The murder of his wife during a botched heist thrusts Orson Gage into a quest for vengeance, and entangles him in a world of villains, violence and duplicity, where the line between friend and foe is blurred. DEAD BODY ROAD is unabashedly derivative of works Elmore Leonard and Richard Stark. The premise could be ripped from the minds of both those authors. It is not especially innovative, and it’s not ‘genre defining.’ It’s simply a great crime comic; a love letter to the grandmasters of crime fiction, and an artistic tour de force. Which is enough to make it one of my favorite comics of the year. Revenge tales are a time a dozen, but very few have the benefit of Matteo Scalera’s artwork. 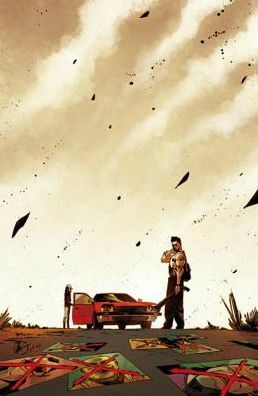 Already a fan from his work on BLACK SCIENCE (which I reviewed recently), DEAD BODY ROAD is exactly the type of story perfect for Scalera’s talents. Amidst the scratchiness and unique flamboyance of the art is a layer of realism necessary to ground the story. Car chases rarely work on a static page, but Scalera pulls off a scene with aplomb, capturing the pace and adrenaline of an equivalent scene from a blockbuster film. The visuals alone make DEAD BODY ROAD worth the price of admission. It really is a treat. But take nothing away from the writer, Justin Jordan. He doesn’t try to hide his story’s influences, instead makes sure he hits the high notes of his predecessors and contemporaries. DEAD BODY ROAD is not a blatant facsimile of single story we’ve read before; instead it massages a multitude of stimuli into its final product. It’s a perfect salute to the genre’s greatest writers. And it’s a darn fine one.